Umbrella company reviews are a useful way to determine whether an umbrella company is right for you. It’s an important part of the comparison process, which can make things easier in future as you bill through the company. But what exactly should you look out for in reviews for umbrella companies – and which other things should you compare? Most of us have come across reviews at some point. They’re essentially short evaluations given by customers for any given product or service after buying or using it. Reviews are a popular option when comparing products online, with 91 percent of people reading them. They count for a lot too. A huge 84 percent of people said they trust online reviews as much as their own friends. 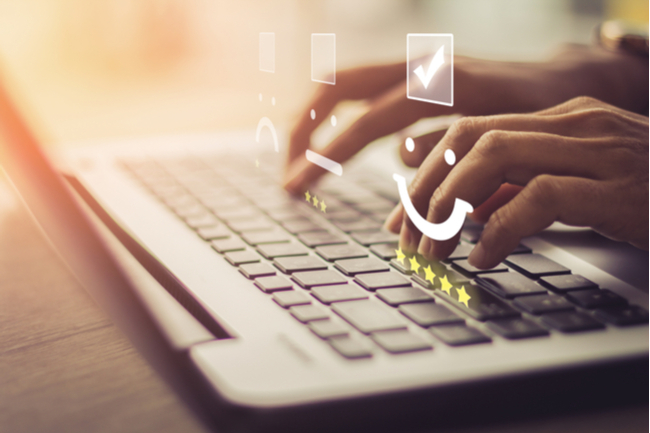 Whether it’s a phone, sofa or just some new clothes, people use reviews to see whether a product is worth its salt, as well as checking for any problems with the provider or supplier. The same is true for umbrella companies. What goes into umbrella company reviews? So, what do contractors actually include when reviewing an umbrella company. First of all is whether they get things right. Contractors rely on their umbrella company to pay them the right amount with the correct deductions. Anything else makes the umbrella company not fit purpose. Timing is another important issue. Some umbrella companies may get their figures right, but are consistently late with payments. For contractors, this can mean an extra worry about when money is coming in – which isn’t what you want from an umbrella company. Next is the customer service itself. How are your needs dealt with? Are things quickly rectified if something does go wrong? Do you have a dependable point of contact in case of late payment or a change of circumstances? Helpful, friendly staff are the icing on the cake, that can turn a 3 star review into something more impressive. With all that said, it’s not all positive feedback when it comes to reviews themselves. Firstly, reviews aren’t all objectively displayed. That means some reviews are hand-picked by umbrella companies to showcase their best feedback. So, when you’re on their site, especially the homepage, you may see a string of five-star reviews. That will make the company look like the best you can get, while their bad reviews are factored out of the equation. Even on what seems to be a dedicated reviews section, site owners can remove or edit negative reviews. If it’s on their site, they’re in control. That’s why impartial review sites like Trustpilot are a better option. These sites aren’t perfect though. Umbrella companies know the importance of positive reviews and a good reputation. Some may go as far as paying marketing agencies to boost their reputation by posting fake positive reviews on different platforms. Not only that, the ‘impartial’ sites will happily push a provider further up the rankings for the right price. Even when sorted by their average review score, you may find the top few places on comparison sites are taken by sponsored listings. It’s clear that reviews aren’t the best way of comparing umbrella companies, and they’re certainly not a standalone measurement of quality. For one, they don’t give you a clear picture of what services and benefits are on offer with each provider. That results in a pretty mixed bag in terms of what you can infer. Even if a company has been badly reviewed, it may simply be down to the wrong fit. Some contractors might enjoy the benefit of paid leave, for example, while others just want to receive as much of their wage as possible and minimise costs. Maybe it’s a problem with weekly wages versus monthly pay. Whatever the issue, it’s important to find the perfect umbrella company for you and remember that this might not necessarily be the best for other contractors. Using an effective umbrella comparison site, you can find a wide range of umbrella companies to determine which is the best option for you. Whether you’re looking for minimal costs, maximum benefits or the most flexible option, an umbrella comparison site allows you to filter and sort the results to fit your needs. Once you have a list of providers, you can then review the different criteria for yourself. That includes things like take home pay, payment terms and whether you’re free to leave the company at any point, as well as benefits like sick pay, paid holidays, childcare vouchers, maternity or paternity leave. Following this, you may find reviews useful as a final deciding factors. That’s fine. Once you’ve narrowed it down to a few providers, it may be a good idea to check reviews elsewhere for a bit of reassurance. At Umbrella Broker, we understand the importance of getting the right umbrella company for you. But we know that there are better ways to do so than using umbrella company reviews alone. Our umbrella comparison site allows you to compare a multitude of top providers based on your specific circumstances such as income, parenthood and marriage status. With fast, clear and detailed results, you can review different providers and select the very best for you with no hassle whatsoever.